Professional kit consisting of 7 tools for fast and convenient trim panel and car interior elements removal (dashboard items, radios, door cards, moldings, etc) and car tuning. Polyurethane tools allow you to dismantle upholstery and plastic panels without scratching or damaging painted, leather, chrome-plated and other surfaces. The tools can be used for any car. Narrow remover (flat blade / angled pry bar) × 1 pc. Narrow remover (flat blade / angled end) × 1 pc. Panel removers with sharp ends × 2 pcs. Handy remover (angled pry bars) × 1 pc. 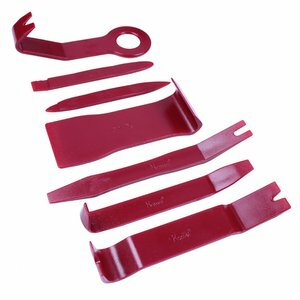 Wide remover (flat blade / angled pry bar) × 1 pc. Pull-type remover (loop / angled pry bar) × 1 pc.